With each day the Wombats become more mobile. The countdown to the end of our relative freedom as parents is quickly coming to a close. Soon there will be no end to the horrors these little guys will put us through. For months we've been saying that we should clear out the bottom shelves of the cabinets beneath our television. Tuesday morning the guys decided to show us the true cost of our procrastination by scattering Wii games all across the living room. Our last day in France, during our honeymoon, we had dinner with Jen's old host family in which Jen's host mother made a fantastic dinner. I, getting over a mild bout of food poisoning, sadly could not enjoy how amazing it was. 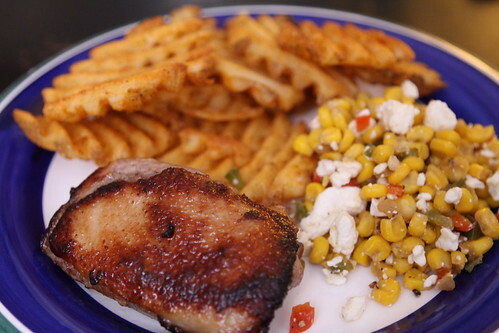 I do remember there was some delicious duck with wonderful, crispy fried potatoes. I unintentionally did a really poor recreation of that on Tuesday night with some waffle fries and a salad made out of the leftover corn with feta cheese. 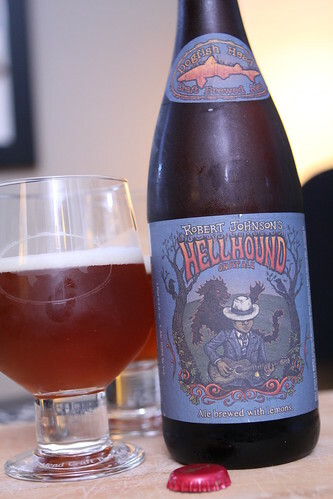 For beer we had this 2011 bottle of Robert Johnson's Hellhound on my Ale from Dogfish Head. It's yet another absurdly malty music collaboration from the experimental Delaware brewery. It claims to be 100 IBUs. I couldn't really taste it. I think that's mostly due to the extreme hopping that seems to go in just about every limited release these days. Yesterday I arrived to an empty day care only to find out that the Wombats were at the park. I went over to meet them and was greeted with the opposite of what I normally find: a sleeping Martin and a wide awake Elliott. At home Martin woke up and reminded me, again, how dangerously close they are to being able to get into just about anything they want. Fortunately I had spent the afternoon doing some minor baby-proofing which meant that at least our Wii games and DVDs were safe. This was convenient seeing that our Wii is broken and nobody watches DVDs anymore. The Wombats like to pretend that they aren't hungry. Their favorite thing is to swat away my spoon as I try to feed them. Last night, after many attempts to feed them, I just cut up some cheese and put it in front of them. I turned my back and then, after a minute, I turned back to see that Elliott had eaten all of his cheese and was making moves to steal some of Martin's. 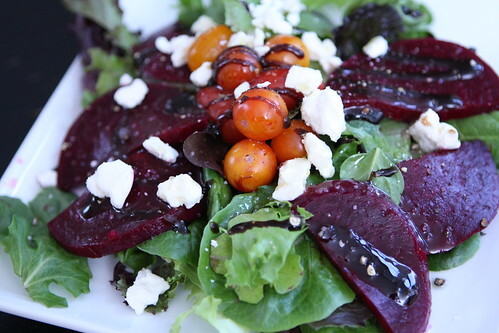 After wrestling these clown to bed again I made this beet salad with feta and cherry tomatoes. I also made the dinner I was going to make last Friday but ended up putting into the freezer after discovering my cousin was stuck in Stamford after the train ahead of him derailed. 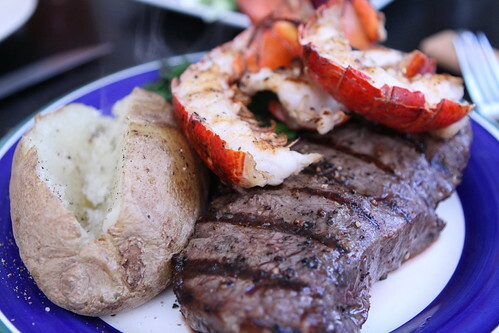 I grilled up some sirloin and lobster tails and sauteed some beet greens, serving it all with a baked potato. 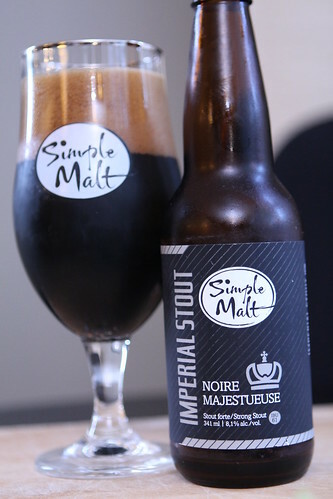 For beer I had this Imperial Stout from Brasseurs Illimités, another from our trip to Montreal. Tonight I tried a new tactic and only fed them pieces of food they could feed themselves. It's started already that these ungrateful little buttheads don't want to have anything to do with me feeding them. Instead they want to feed themselves because they're so good at it. 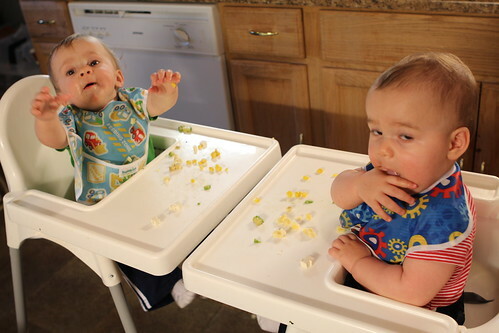 Just look at how little mess they make! They're pros. Pros, I tell you! After feeding them I tried a new technique where I gave them their baths then fed them their bottles after they bathed. This calmed them down a bit from their normal post-bath frenzy and it was relatively easy to get them to bed afterward. 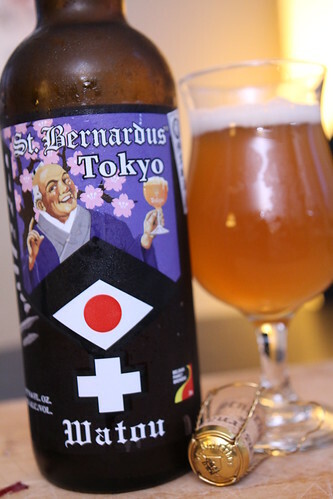 I celebrated by opening this Tokyo by St. Bernardus, a beer brewed only once for the opening of St. Bernardus pub in Japan. It was light and refreshing, the perfect way to celebrate a successful new technique used to get the babies to bed. 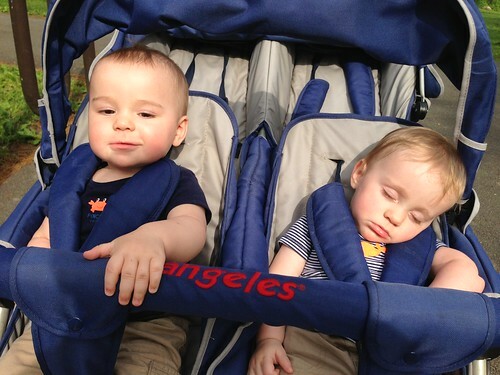 Once again I think I've figured everything out and found a foolproof technique for putting them to sleep. It's going to be a great three or four days until this doesn't work anymore. 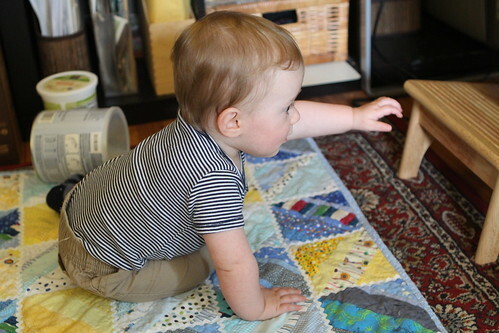 Someday you will look back fondly on the crawling stage and think how relatively *unmobile* they were. 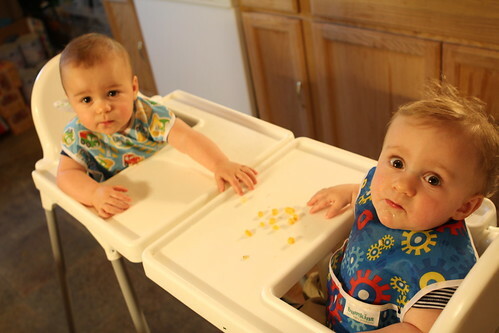 Then you will do another blog post discussing the boys' walking and your need to add yet another layer of child proofing.